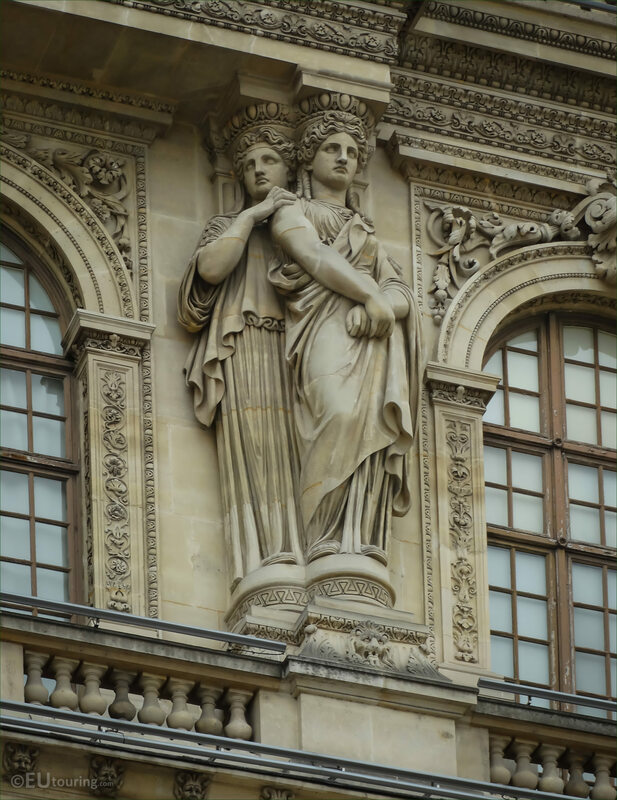 We were at the Musee du Louvre in the 1st Arrondissement of Paris admiring the architecture and took these high definition photos of a set of Caryatids, which were sculpted by Francisque Joseph Duret. This first HD photo shows a set of Caryatids that are located on the Pavillon Sully, and these have been used for centuries as architectural supports instead of columns or pillars and are always depicted as ornate female figures. And you can see that they have an entablature on their heads to support the pediment above, with the earliest examples of these being found in Athens, yet these particular caryatids, spelt cariatides in French, were put in place in 1857 during the restoration of the former Palais du Louvre. 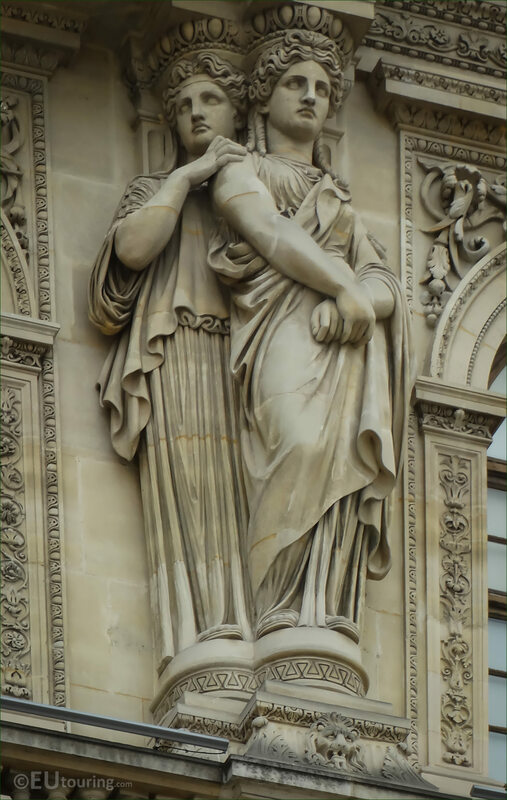 So this next image shows a close up of the Caryatids with the fine detailing that went into producing these, which was by Francisque Joseph Duret, who was born in 1804 and was the son of a French sculptor called Francois Duret, inevitably following in his fathers footsteps. But not only did he study under his father, he also studied under Francois Joseph Bosio and having entered the Ecole des Beaux Arts, Francisque Joseph Duret won the Prix de Rome in 1823, which then led to numerous public commissions for statues and sculptures. In fact, there are many different ones you can find at famous tourist attractions in Paris, with probably one of his most well known being the central sculpture on the Fontaine Saint Michel, yet he also produced statues for places such as the Palais de Justice, the Madeleine Church and several for other churches and the Chateau de Versailles. 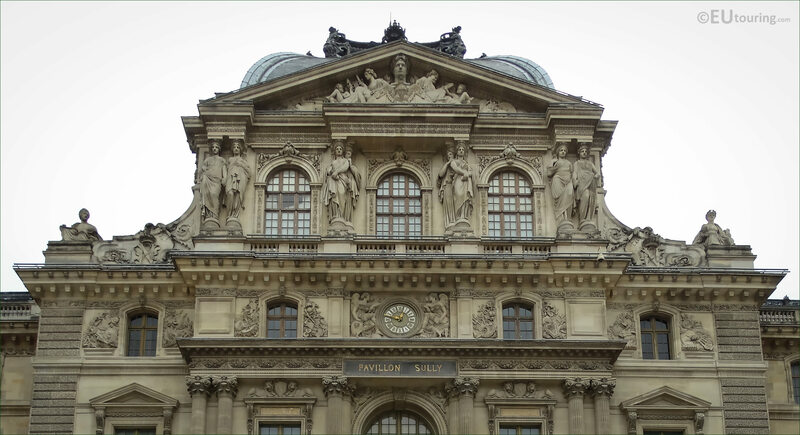 Yet getting back to The Louvre, in this last photograph you can see the entire top section of the Pavillon Sully with the caryatids by the dormer windows underneath the pediment, which can be seen from the Cour Napoleon courtyard. And this set sculpted by Francisque Joseph Duret is located third from the left hand side, however, he also produced the set of two caryatids statues located second from the left hand side, along with a pediment on another pavilion of the Musee du Louvre, still continuing to produce different works even after he became a professor at the School of Fine Arts.